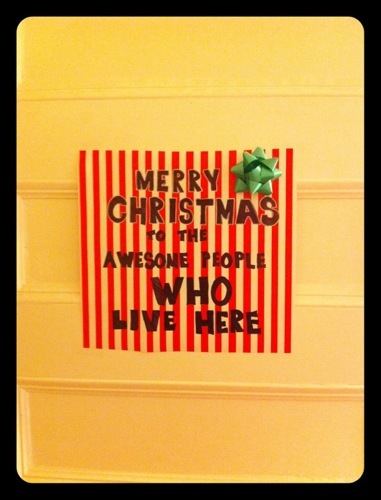 Finding mischievous holiday surprises in your hallway in the morning! (see above), “Seek Your Course” – an online hub for finding Creative Learning & Living courses, Lovely customized double rings from Etsy, inspirational emails, REAL mail, WW cuffs, days in December where you can wear sandals, knowing this recipe for Warm & Nutty Cinnamon Quinoa will make it into my winter breakfast rotation, Peanut Butter Banana & Oats Shake (which is in my current breakfast rotation), new much-needed purple winter boots, Getting excited for visiting my family in Colorado! Little love letters, banjo calluses, veggie spring rolls, Katzenjammer, peace, love, & feminism. Heheh. Elves, I say… Mischievous elves!